TUESDAY, 26 APRIL – Various areas of cooperation will continue to be strengthened between Universiti Malaysia Sabah (UMS) and the Democratic Republic of Timor-Leste. UMS Vice-Chancellor, Professor Datuk Dr. Mohd Harun Abdullah said among those identified included teaching and learning, research and innovation, marine science, eco-tourism, rural health and medical care, and language proficiency. Earlier, he said the cooperation in oil and gas industry with Timor-Leste in 2014 was now bearing fruit particularly in the areas of training and capacity building in the field of oil and gas. The first group comprising 15 students from Timor-Leste were sent to undergo the Diploma in Process Engineering (Oil and Gas Operations), whilst the rest studied Diploma in Instrumentation Engineering (Oil and Gas). “These two programmes have been specifically designed by experts from the Faculty of Engineering (FKJ) to meet the specific needs of Timor-Leste,” he said in his welcome speech at the Public Lecture of the Vice Minister of Education II Timor-Leste, Abel da Costa Freitas Ximenes at the Banquet Hall, Chancellor Hall yesterday. His speech was read by the Deputy Vice-Chancellor (Student Affairs and Alumni), Associate Professor Dr. Ismail Ali. 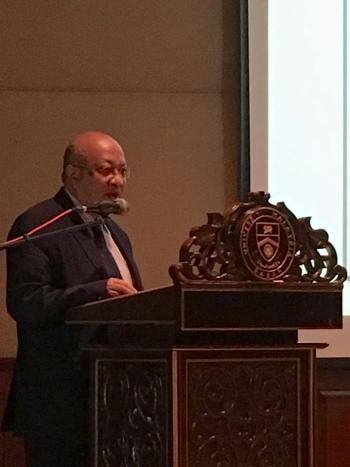 Datuk Harun said such cooperation would continue and UMS was expecting the second batch of students from Timor-Leste totaling 20 to undertake the diploma programmes.